We love the interior of this penthouse! Once you step into it, you will feel like you are in a dream world of fantasy because in every corner, there is something whimsical and lovely that you will not see in ordinary homes. The colors in it are very energizing while the decorations are breathtaking which you will not expect to see in the space. 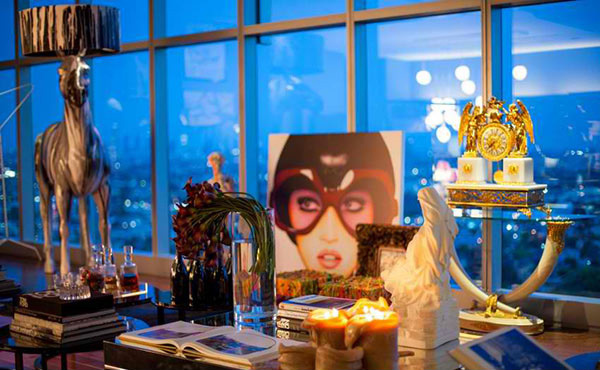 The penthouse is located at the nineteenth floor which combines modern furnishings and treasured memories of the old. Like what Maxime Jacquet said, the interior “is everything, luxury, casual comfort, vibrant energy, fashion, and humor”. In the penthouse, you will see vintage furniture, neon signs, chic accents, antique cartoon murals, designer blankets, bear skin rugs and many others. The way we look at it, the interior is decorated with some personal collections of the owner. But surprisingly, the design does not detract the view to the cityscape. Instead, it provides a lovely view of the city while getting the feeling of being in an exclusive club or lounge. 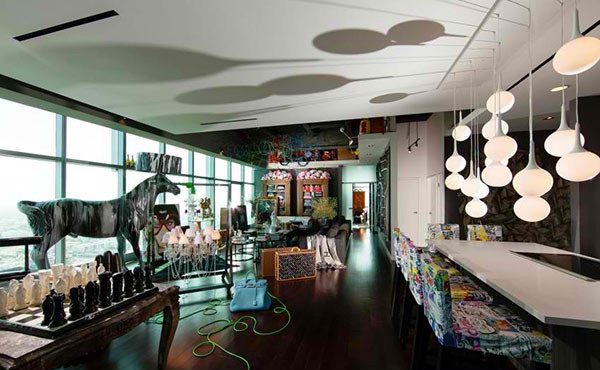 Being unique is reflected in the interior design but it also promotes the aura of fun enjoyment and even entertainment. 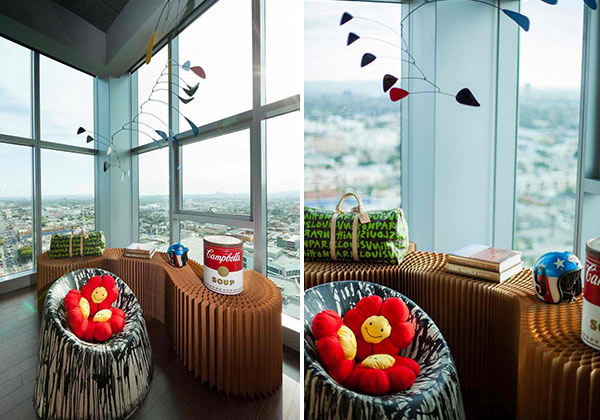 Come and take a look at the lovely chic interior of this penthouse located in Los Angeles, California, USA. From here, you can see a huge portion of the interior and you can notice that it really has an eclectic decoration. 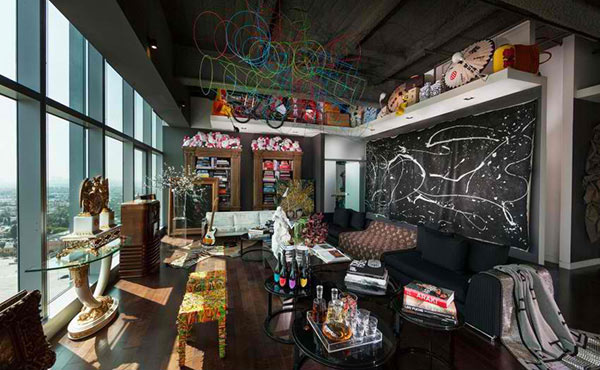 When you think of art, you will see all that in this living area from the colorful ceiling decor, walls and furniture. 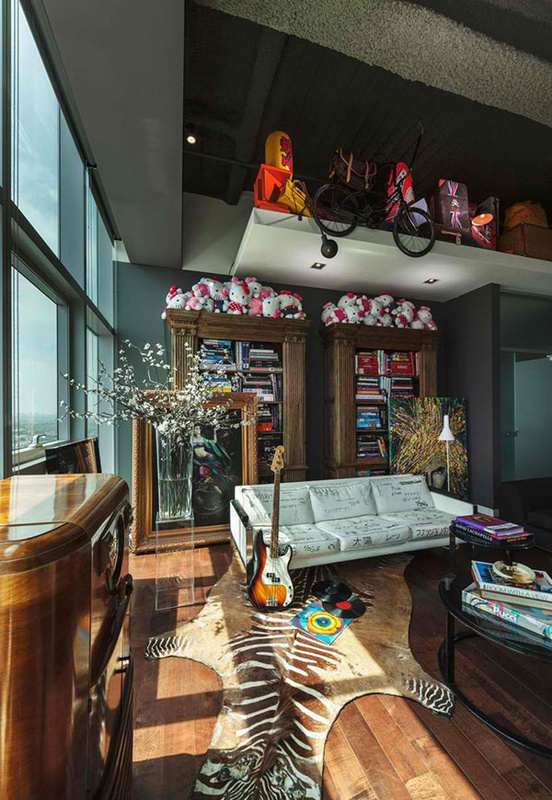 Our eyes were immediately drawn to the bunch of Hello Kitty stuffed toys on top of the cabinets! But of course, we noticed the vintage stuffs above it too. 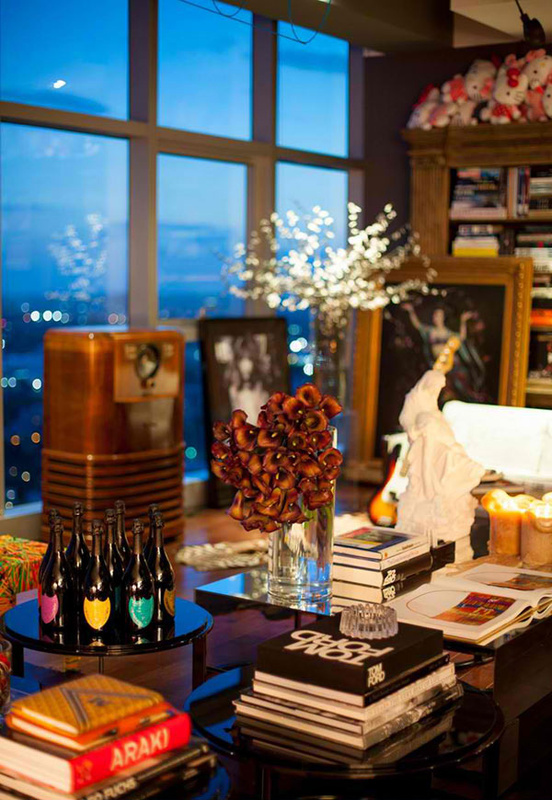 This is one table in the house that is decorated with a mix of books, bottles, candles and sculptures. Don’t you just love the bottles here? And of course, you will be given the idea that even books can be perfect as decorations. Different paintings were used for decor in this bedroom just like the mural of a lady on one side of the wall. Adding interesting furniture in any space will enhance its look just like what you see here. Note also the childish flower throw pillows on it. If you think the bathroom is boring, you are wrong. Aside from the rubber duckies, you will also see other chic decors in it. From here, you can see a breathtaking view of the city. This writing in the mirror is done with a lipstick. Cute, right? Some may look at this bedroom as a bit noisy but we think it is nice and very youthful! Instead of a wall decal for the line “And I said I Love You”, it was spelled using light! Artworks are seen here everywhere. Even the blanket and lighting seem to appear like artworks too. Oh, we love that bag and pair of shoes! But we know draw your eyes to the area rug as well as to the decors you see here. Just stunning! Another bedroom in the penthouse that has a bed with a huge amount of details in it. This is the bedroom with a mural of a woman’s face on one side. Another batch of artworks is seen here. The table has that grungy look but it looks very artistic and looks at that chair where the dog is perched! Lovely! How lovely! 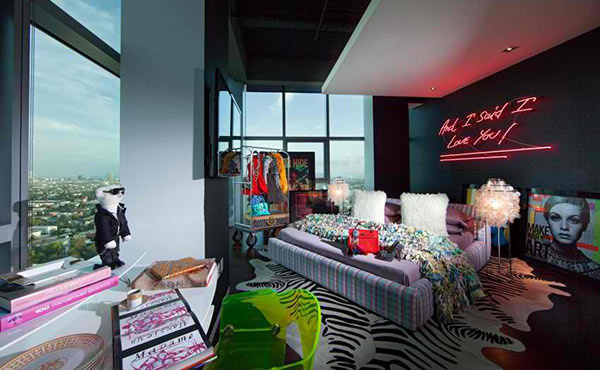 We actually envy this high-rise penthouse because it seems like every girl’s dream. This shows us that you really don’t have to follow the trend to be in. But, it is better to be unique and create your own interior based on your likes and interests. Doing this will make you love your home more as it reflects your own personality. What is your favorite part of the penthouse? Well, we love everything in it especially that it gives us the feeling of being in a private abode hidden from the rest of the world even if you are actually in the heart of the city! Hats off for Maxime Jacquet for a job well done!